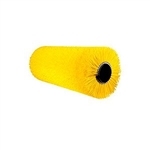 Replacement brushes and brooms for sweepers and automatic floor scrubber machines, Tennant floor scrubber brushes, and brooms. OEM and aftermarket, poly, super abrasive, still poly, poly and wire, and nylon brushes. If you don't see the brush or broom you're looking for or don't know the part number, Contact us, We have it! 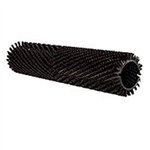 Tennant 1033375 main poly brush used with Tennant M30 rider sweeper scrubber.